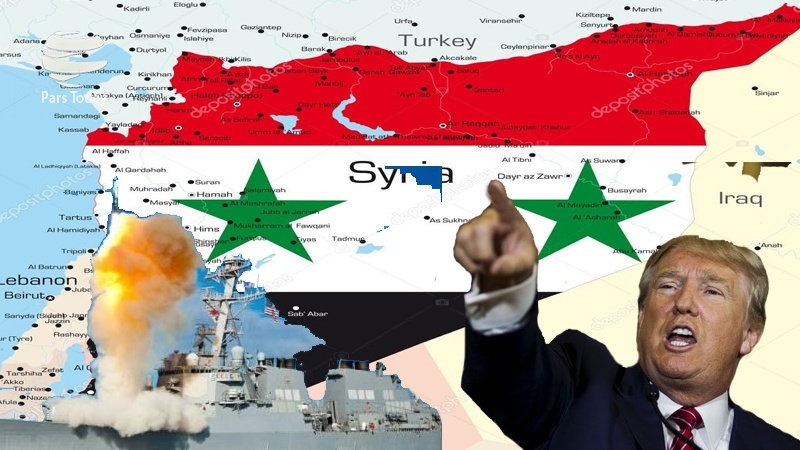 Is the Bombing of Syria the Beginning of President Trump’s Wars around the World? The alleged using of chemical weapons by President Bashar al-Assad against his own people is just another hoax by the US Empire such as the LBJ’s Gulf of Tonkin case and G. W. Bush’s Iraq WMDs case have been in order to create a reason for an American „official“ involvement in the Western-initiated war against al-Assad and President Vladimir Putin in order to fabricate another regime change, which former US President Barack Obama was unwilling to deliver because of his support for the so-called moderate terrorists that have been called „rebels“ by the West. Assad does not have to prove his innocence but the burden of proof rests on „prosecutor“ Donald Trump. There is still some hope that the US war hawks and the terror alliance in Syria may not have dragged the US into the Syrian quagmire. So far, there hasn’t been any evidence presented that the Syrian government used chemical weapons against its own people. President Bashar al-Assad is not as stupid as Western media propaganda outlets want to make the public believe. How come that Donald Trump was so carried away by this attack on „sweet little children“ that he ordered a military strike against Syrian military installations, knowing that this country doesn’t possess any chemical weapons at all to which the United Nations and the Obama administration approved of? Even President Obama wasn’t that naive when the terrorist organizations in Syria attacked the people with chemical weapons years ago in order to inspire the US to side with the terrorist forces. After Security adviser Michael Flynn was brought down by the Deep State, the next victim will be Steve Bannon, Trump’s chief strategist. The loss of his seat in the National Security Council will be the beginning of the end of his career in the White House. Perhaps Press Secretary Sean Spicer will follow suit. His performance was somewhat less than perfect, to say the least. How crooked and rigged the US political system is, shows that even 16 intelligence agencies plus the FBI haven’t come up with the slightest evidence that the Russians „hacked“ and manipulated the American elections. A totally corrupt political system doesn’t need further manipulations by a foreign power! Didn’t senior Trump officials stated just recently before the attack that they didn’t want to topple President Al-Assad? His government has handed over his entire chemical stockpile to the Russians after the terrorists used Sarin gas the first time in order to drag Obama into the Syrian war. It’s well known that the so-called good terrorists have chemical weapons. These guys are best friends of the US, the Israelis, the Saudis, and the other Arab regimes that the Trump administration is cozying up to. Trump doesn’t mind that the Saudis are killing Yemenites by the tenth of thousands. But as I said, it’s not about the victims; it’s about power politics of the US Empire and not about personal feelings of Trump towards Putin. Dieser Beitrag wurde unter US-Aussenpolitik abgelegt am April 14, 2017 von Ludwig Watzal.